Instant free orders on DEX - why not? Not possible to put order quick and no fee? Like normal exchange. Place order so it instantly matches, i.e. if you buy, place bid at the ask price; if you sell, place ask at bid price. Find someone to trade with in the forums/chat. I recommend Telegram. When you agree on price and quantity, you both place matching orders. The third solution does not exist yet but is IMO an excellent business idea. It will enable what you asked for - free instant order placing on DEX with fees only when orders match. An order (signed transaction, that is) is sent to the market maker. He withholds the order until a matching order either exists on the DEX or is sent to him. Or the order expires or is canceled, and so he deletes it. The market maker will constantly update and publish the order book. The user will be able to place, change and cancel orders in real time. The signing of transactions happens locally and the wallet is open source. The market maker’s handling of orders can be kept closed source. There’s more to it and I think it’s beyond the scope of Counterwallet but as a 3rd party for-profit project, I believe it makes sense. Compared with a traditional exchange, the user has no deposits to worry about. He controls the key and a rogue market maker can only cause the loss of a transaction fee (and possibly a bid-ask spread). The DEX, even without this, is highly popular. 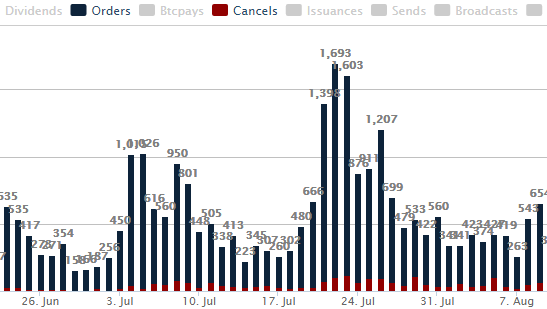 Even at the height of the mempool/fee crisis, hundreds of orders were placed every day (some days even more than a thousand). If a market maker charges a small fee, it should be possible to earn money from day one. I think the only piece of the puzzle missing in order to make this work is the ability for the protocol to support transactions that expire at a certain time/block.